Landline 9-1-1 Fees are paid by the telecommunication company directly to the city or county assessing the fee. Click here for a list showing the rates and the remission address. Wireless, VoIP and prepaid fees are paid directly to the Oklahoma Tax Commission. The Taxpayer Assistance line at 800 522 8165 can assist you in complying with the current law. https://www.ok.gov/tax/. Call taking boundaries may not follow jurisdictional boundaries because of interlocal agreements, telephone exchanges, or emergency responder territories. If you have a question which jurisdiction answers your 9-1-1 call, contact 918 584-7526 or dhuckabee @incog.org. 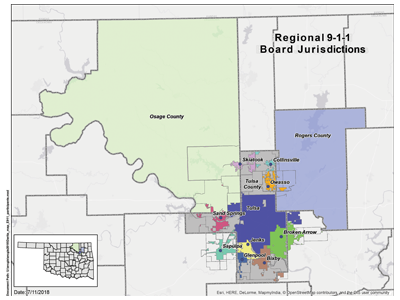 Thirteen local jurisdictions cooperate in the purchase of 9-1-1 equipment, network and services covering Tulsa, Rogers and portions of Creek counties. Cooperation reduces costs and enables full interoperability in the event of a disaster. Participating jurisdictions pictured to the left. All new addresses have to comply with 9-1-1 formatting and must be pre-entered into a database in order to get the emergency responder to the right place when you dial 9-1-1. If you need a 9-1-1 address assigned, contact your local jurisdiction. If you live in unincorporated Tulsa County and need a 9-1-1 address assigned, you can call 918 584-7526 or email wkramer@incog.org. The Oklahoma 9-1-1 Management Authority annually verifies the boundaries for each 9-1-1 call center, and allocates 9-1-1 fees based on population within those boundaries. The Authority also administers a grant program to enhance 9-1-1 services statewide.